What an absolutely beautiful color!! The complexity of it amazes me, with how many different shades of blue (my favorite color) there is. From navy, to teal, to sea blue etc. 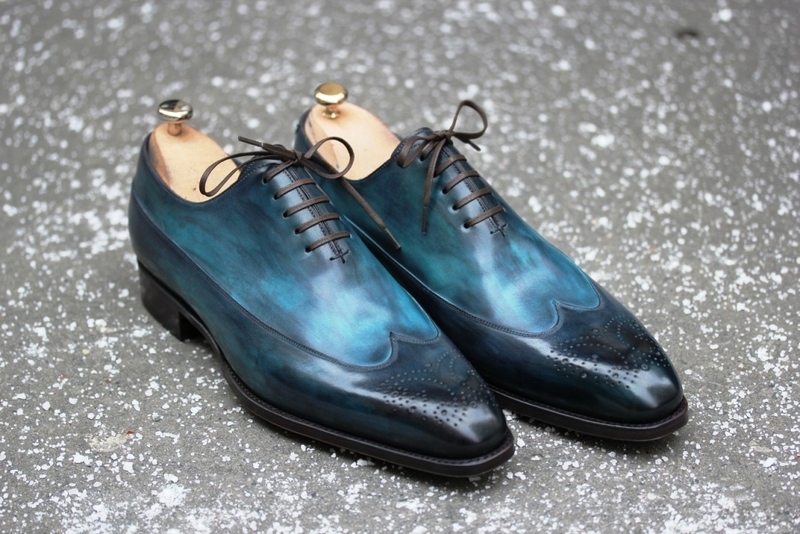 it’s a array of blues that leaves one of the most amazing colors (if not the best) that I have seen on a pair of shoes. I just might have to commission one of these and unfortunately steal the idea of whomever is the owner. Don’t worry, I would do a different model, as not to be an exact copy-cat! Septieme Largeur continues to impress me, particularly with how easy they make having a shoe company is, from their classic (yet unique) styles to their amazing patinas, to the lovely last shapes and finally, the wonderful prices. It’s no wonder they are getting big, very quickly! My hat is tipped to the gentleman that issued this shoe, as no doubt, when walking down the street heads will turn and impressions will be left! If only more men had to courage to do this (wear bold colored shoes), as I know that they would like to! Nope. 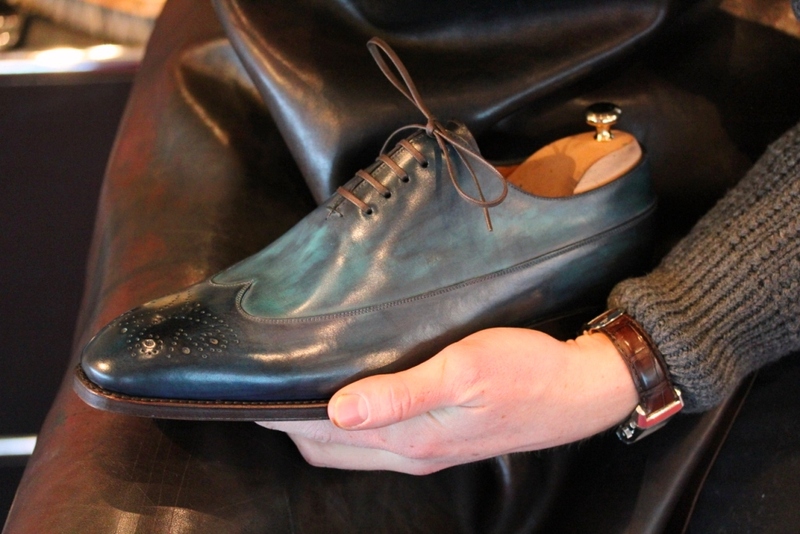 The shoes are machine-made, with good quality control; only the (eventual) patina is applied by hand. How does one keep shoes like that nice and polished? Natural shoe cream? To maintain this kind of patina is a bit tricky. The dyes used by French artists are alcohol based, so you cannot use acetone or mineral spirits to remove the old polish. Instead, use a LITTLE drop of Saphir Cr�me Universelle on a clean rag, with ZERO pressure. Even so, there’s a 90% probability that you will decolor the shoes a bit. Next, if you have access to the exact cream colors (some french brands sell a staggering 121 color tones! ), you must lay a thin veil of color cream, beginning with the light colored sections (easier said than done). Otherwise, use neutral cream. Wait patiently for absorption, otherwise the colors will meddle and you will curse like a Dutch sailor. Brush gently. For the mirror shine, after everything has set down (wait 8 hrs just to be sure), use neutral wax polish. Anon – Apart from what Il Satiro said, the way to keep shoe nice and clean is to be aware of your surroundings, wipe them down every night, feed them with a good conditioner every now and then (when they need it) and use lighter polishes (like tan) to bring up the undertones in the patina. Il Satiro – It sounds as if you are quite informed. Thank you for your responses! And Justin, is there anyway to make the commenting process easier? I’m having trouble with a lot of the coded security words. Calvin – Hey long time no hear!! Good to have you back. Unfortunately there is no way to making commenting any easier, I already get enough spam as it is, couldn’t imagine how that would exponentially increased if I disabled the word thing. Sorry. Thanks for sharing though! !